to share and educate state legislators on the benefits of Head Start and Early Head Start. Early Head Start programs in Illinois. "Strong Bright Futures Begin at Head Start"
We'll start our day with a rousing and energetic kick-off and then individuals will have an opportunity to meet with their state representatives. Each of you will be supported by IHSA staff, consultants and Board Members. So join us for a day of fun! You will receive a t-shirt and lunch will be provided! STEP #1: Sign yourself up (free below) for the Rally. STEP #2: Say yes to (free) boxed lunch & bottled water. Step #3: Select size of (free) t-shirt; wear on Rally Day. Easy as 1-2-3, just click GREEN button below & sign-up. It will be a great Rally Day so mark your calendar now! 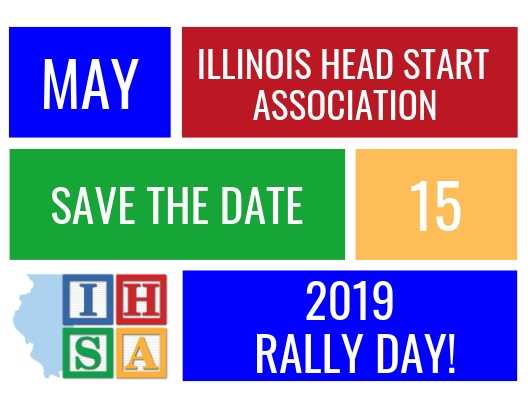 If you have a moment, check out Springfield's Illinois State Museum website http://www.illinoisstatemuseum.org/ where we gather to kick-off our RALLY, visit our legislators, enjoy lunch, regroup, and then wrap up all the day's excitement with closing remarks by our IHSA Exec. Director and others!